Mahabalipuram, the temple town of India located along the shores of Bay of Bengal. This historic town is located at about 60 kms away from south of Chennai. The structures are called Rathas because of their peculiar architecture and shape. The word â€˜Rathaâ€™ means the â€˜chariotâ€™. These temples are named after the presiding gods and their images in the temples. 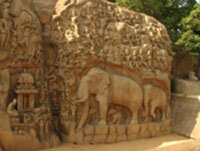 Mahabalipuram is regarded as one of the archaeological wonders of India. The ancient carvings and the sculptures make for a wonderful experience of the glorious past of India. These age old architectures still influence the present Indian art and sculpture. The â€˜Rathaâ€™ temples are the cave temple made of rocks. The rathas are regarded as the five rathas of Pandavas, the eminent characters of the Mahabharata. The stone chariots tell us stories of the by gone days of Mahabalipuram. The rock cut temples with exclusive sculptures make the temples more attractive for the tourists and archeologists alike. Draupadi Ratha- This Ratha is named after Draupadi, the wife of Pandavas. The Ratha is famous for its mythological background and architecture. The intricate stone carvings make the chariot unique. This Ratha is dedicated to devi Durga. Arjuna Ratha- Arjuna is the third son of Pandu, the king of Hastinapur. Arjuna was the best archer of the age and was respected all over for his courage. The Arjuna Ratha was carved in memory of Arjuna. Arjunaâ€™s Ratha is dedicated to Lord Shiva. Bhima Ratha - The strongest son of Pandu, he was the second pandava. The intricacy of the stone work is the specialty of the temple. Mahavishnu is the lord to whom Bhimaâ€™s chariot is dedicated. Dharmaraja Ratha - The eldest son of Pandu was known as Dharmaraj for his truthfulness. This Ratha temple was built in his memory. Harihara is the lord to whom the Chariot is dedicated. Nakula Sahadeva Ratha - the twin brothers Nakul and Sahadeva and the temple is regarded as their chariot. The chariot is dedicated to the god of rain, Indra. The rock chariots differ from one another in respect of structural design and contour. Their specialty is the unique architecture and the stone carvings. The Pancha Rathas, Mahabalipuram are monolithic temples. These rathas are regarded as important shrines for the Hindus as the mythological characters play an important role in Indian life.